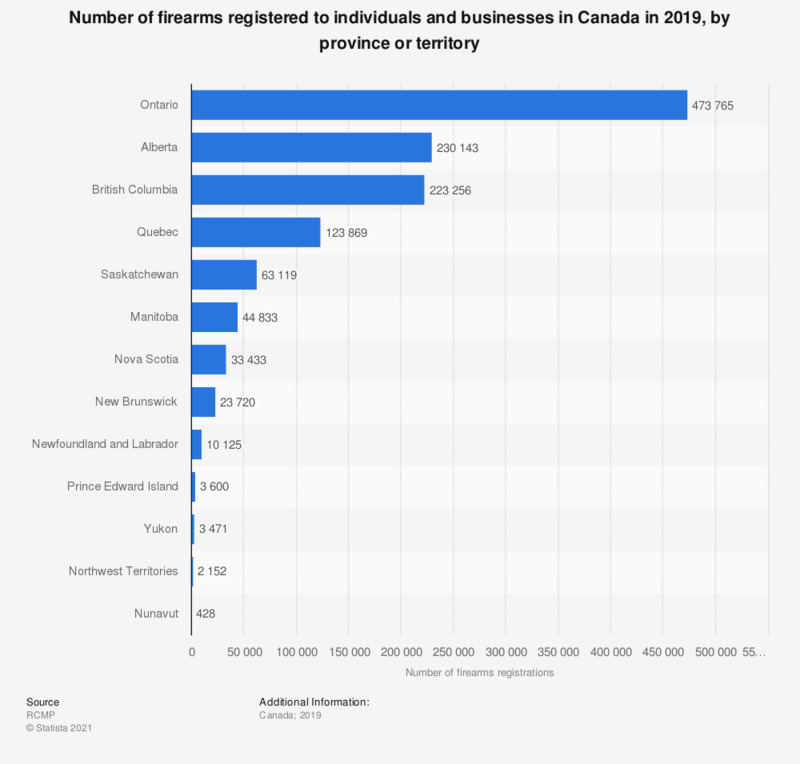 This graph shows the number of firearms registered to individuals and businesses in Canada in 2017, by province or territory. In New Brunswick, 22,223 firearms were registered in 2017. Gun ownership rates in Canada are on par with those of Western Europe and much lower than its southern neighbor, the United States, which is consistently the highest in the world. The main reasons for gun ownership in Canada are hunting and target shooting. Guns are not kept for self-defense as its legality is extremely restricted. Although it has been relaxed some in recent years, legislation on gun-control is also comparatively strict. First time gun owners must complete a safety course and pass a background check, but since 2015’s C-19 bill, non-restricted firearms are no longer required to be registered for ownership. Firearms that fall into this class are ordinary rifles and shotguns that do not meet the requirement for being restricted or prohibited, the two other of Canada’s three-tiered firearms classification system. Restricted firearms are those that are semi-automatic, handguns not prohibited, and rifles and shotguns shorter than the minimum regulated size. Prohibited firearms, despite the name, are not completely barred from ownership. The guns that fall into this class are pistols with a barrel under the minimum legal length, sawed-off shotguns and rifles below the minimum legal length, fully automatic weapons, weapons converted from auto to semi-automatic fire, and those firearms prohibited by the Criminal Code Regulations. Despite regulation and an increase in the number of people barred from possessing firearms, gun ownership has been increasing. The number of restricted firearms registered in 2017 was 42 percent higher than 2012 numbers.